As a change from runner beans, try growing climbing French beans up a wigwam in the border or on a trellis or arch. Varieties with yellow-, purple- and red-flushed pods are available, as well as the plain green ones. Most have white flowers, though some have pale mauve blooms. 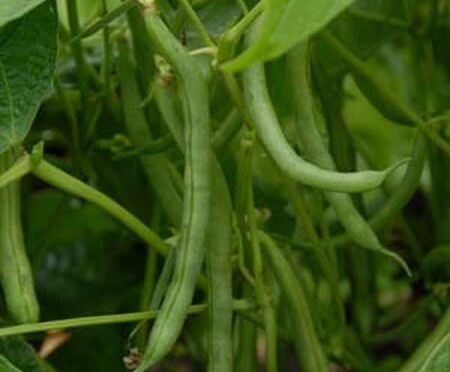 What is the difference between climbing French beans and runner beans? Both originated in South America and were brought back to Europe in the sixteenth century. The British favoured the runner bean (Phaseolus coccineus), while elsewhere in Europe, Phaseolus vulgaris was preferred, which led to the common name of French bean. In Gardening Which? trials, French beans have given a better crop early in the season, but have been overtaken by runners later on. French beans are better in early summer or under glass because they do not rely on insects to pollinate the flowers. Sow the seed, two to a 7-cm pot, under cover. Prepare supports, unless you are using an existing garden structure. Simplest is a wigwam of bamboo canes or bean poles. Erect it so there is a base of at least 60cm diameter, with the supports spaced 15cm apart and tied securely at the top. French beans are not as vigorous as runners – supports 1.8m high should be sufficient. You can substitute strings for alternate canes if you prefer. They can also be grown in long rows like runner beans. Enrich the soil by digging in well-rotted manure or garden compost, as for runners. Plant out after the danger of frost has passed. You can also sow seed directly into the soil this month. Sow two or three seeds, or one plant, 15cm apart. Ideally, each plant should have its own support. As with runner beans, pick the pods regularly when they are still tender. Towards the end of the season, leave some of the pods to mature. These will become dry and brittle and the beans inside can be harvested for use as haricot beans or saved for next year’s crop. French beans do not usually have the nitrogen-fixing nodules of runner beans. Snap a bean to check it breaks cleanly without any stringiness. Harvest while tender and before the beans inside have started to swell – if you let the beans mature, flowering and continued cropping will drop off. After picking, tie in stray shoots to keep plants neat.